Here are some interesting facts concerning the main themes of the novel. Do they inform or enhance your reading of the novel in any way? In Greek mythology, Dionysus, captured by pirates in the hopes of securing a ransom, turned their oars into serpents, forcing the terrified sailors to jump overboard, before he took pity and transformed them into dolphins so that they would spend their lives helping those in peril or need at sea. Bougainvillea was first classified by the French naturalist Philibert Commerçon (or Commerson) in Brazil in 1768 and named after the French Navy admiral and explorer, with whom he was travelling, Louis de Bougainville, during de Bougainville’s successful circumnavigation of the globe. Also, whilst on this voyage, he identified a particular type of dolphin in the Strait of Magellan that is now referred to as Commerçon’s dolphin. 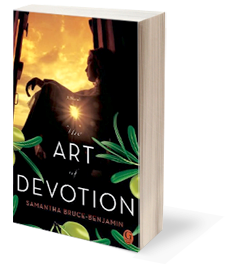 These questions are intended to enhance your book group discussion of The Art of Devotion by Samantha Bruce-Benjamin. The opening lines of the novel suggest that “For each of us, there is a moment: What we see at the last, before God closes our eyes forever; an entire existence distilled to one perfect memory.” Do you agree with this sentiment? Discuss what each character’s “moment” might be. Discuss what yours might be. There are four different narrators, and the novel switches viewpoints frequently. Who do you consider to be the most reliable narrator of the four women? Or are they all, to varying degrees, decidedly unreliable? How did your perception of their trustworthiness shift as the novel progressed? With which character do you most identify? Why? Adora “steals” Genevieve from Miranda and appears to mold the young girl in her image. Given what you know ultimately transpires and the rational behind her seemingly manipulative and cruel decision, can Adora be forgiven? In the context of this act, is her choice barbaric or benevolent? What does the character of Jack symbolize for Adora and what impels her immediate desire to never let him go? The subsequent relationship between Adora and Jack is ambiguous and its nature unclear. How do you perceive their bond? What role do you think each plays for the other? Contrast Adora’s relationships with Oliver and Sebastian to what she shares with Jack. What are the differences/similarities, if any, between them? There are many recurring symbols in the novel: bougainvillea, the olive grove, the sea and the stray dogs. What does the bougainvillea signify to each character? What does the olive grove symbolize? Are the dogs symbolic within that context? Finally, what does Linford represent to Adora? The role of the mother is one of the central themes of the novel, specifically the attributes that might define a “good” one. Discuss the notion of maternal guidance/sacrifice in relation to Sophie and Miranda. Are the decisions they make for their children justified or self-serving? Could it be argued that Adora, although barren, is actually the most selfless “mother” of them all? Throughout the novel, Adora inspires a cross-section of emotions ranging from adoration to hatred, yet none of the characters appear able – or willing – to ignore her. Why is this? Beyond her beauty and wealth, what is it about Adora that proves so compelling to others, even those who despise her? Why can’t anyone seem to escape her influence? The ending of the novel challenges nearly everything the reader has been led to believe throughout the book. Were you surprised by what was revealed? In re-reading earlier passages, do you see any foreshadowing of what would ultimately transpire? The nature of idolatry is at the heart of the novel, specifically Genevieve’s desire to emulate Adora in everything. Given what happens, does Adora condemn Genevieve to an equally tragic life by indulging her in this whim? Or is Genevieve to blame and Adora merely an innocent victim of a crush that turned into a dangerous obsession? Discuss the title, The Art of Devotion, as it applies to each character in the book. All make decisions that have profound, sometimes tragic, repercussions for themselves and others under the guise of “devotion.” Examine the varying types of devotion each character displays. What was the first line of the novel that you wrote? It’s still in the book and I still have the original document. It was Adora: “All I had left was your love: the splintered shards I clutched to my chest, despite the pain.” From the beginning, all I could hear was her voice. I knew from the outset that she was ruined, but I had no idea why or how that had transpired. Yet, I had to write her down; she simply would not leave me. For me, the sentence conjured up an image of the sea. The image of her, clutching shards, struck me, in some way, as if she was marooned from a shipwreck, clutching the wreckage. That metaphor subsequently informed the rest of the novel. How did the idea for The Art of Devotion derive? First of all, I have a long-standing love of the sea, and islands, such as I have known in the Mediterranean, have always struck me as being governed, to some degree, by the whims of the Gods; there’s something precarious about their unparalleled beauty, almost as if they could be consumed by the sea at any given moment. Onto that stage, I wanted to place characters who, by their very nature and existence, inhabit a world, from our contemporary perspective, that we know is inherently fragile; a world so rarefied and refined – of grace and favor and privilege – that, in so many ways, no longer exists. Most crucially, I wanted to present an idyll into which any reader could escape, almost like a holiday itself. Yet, within that brightly lit framework, I wanted to examine the shadows founded on three themes: the nature of gossip, perception, and idolatry, all three of which, I believe, are inexorably linked. By contriving a novel around four distinct “voices,” and examining the same set of events from each different perspective, I was able to play with the idea of unreliable narrators and readers’ allegiances: the characters present themselves without authorial interference, in a sense, because there’s no third-person narration. All the reader knows is what they are told by the characters, in their voices, and it is entirely the reader’s choice with whom they choose to align their sympathies. There is a quote by Anais Nin, that I found myself thinking of often, during the writing of the novel, that asserts: “We don’t see things as they are, we see things as we are.” I think it’s a very powerful and compelling insight. I also wanted to examine universal emotions with which readers would readily identify: grief, love, devotion and each character’s divergent approach to them. Most crucially, there’s no authorial judgment throughout the book: I want readers to believe what they choose, to align their affections accordingly, to agree or disagree with the characters, based only on their own perceptions. Yet, in subverting every single thing the reader believes to be truth at the end of the novel, I also wanted to cast doubt over the blithe assumptions we ritually make: do we believe what we hear or trust what we know and, if so, why? That is the question that dominated the writing of the book and I asked it as much of myself as I would of any reader. Why have you chosen to set your novel in the 1930s? It’s my favorite era, primarily because, I think, like most people, my knowledge of it derives from the wonderful films of that period. The costumes and the actresses and the sheer giddy joy of such cinematic splendor never fail to thrill me. Also, of course, the books of that period are amongst my favorites; A Handful of Dust, Rebecca, the PG Wodehouse Jeeves and Wooster novels, I just revel in them. Yet, more seriously, I’ve always considered the 1930s to be an inherently poignant decade when viewed from a contemporary historical perspective because, of course, we all know now that World War II was lurking on the horizon to change everything. So, there is a fatalistic aspect to that period that I wanted to plumb in the context of the novel. By focusing the predominance of events in The Art of Devotionduring the summer of 1938, I wanted enough distance from rumblings of war to have the characters rest somewhat easily in their privileged milieu, but just enough foreshadowing that a reader’s perspective would be informed by having such an historical reference. I imagined them as gilded idols, drenched in summer, before the fall, literally and metaphorically, almost as if there would never be another summer. It was to be the last of everything – of peace, of joy, of innocence and it had to burn so brightly as a consequence that the full force of the tragedy would be felt – both metaphorically and historically. What is the symbolism of the dogs Adora and Sebastian rescue? Lost and discarded souls, outcasts, almost like Adora and Sebastian themselves; animals who, by the very nature of their existence, are dependent upon another person’s kindness to survive and who will die without it; who, hideously, are so often cruelly and disgustingly abused unless someone rescues them. I conceived of the olive grove where the dogs live as a limbo of sorts: in my imagination the house represented purgatory where Adora would atone for her perceived sins, the olive grove her limbo where she and her dogs were kept safe, and the sea is intended to represent paradise. Within the context of the novel, Linford, Adora’s favorite dog and the guardian of the olive grove, figures as the personification of perfect grace. I don’t think there is a more beautiful dog than a greyhound. So, like Sebastian in his fragility and exquisite beauty, it was my idea that whenever Adora was in Linford’s gentle, knowing presence, she felt not only entirely understood, but forgiven, in that he accepts her companionship and asks absolutely nothing of her. He functions not only as her sole friend, but also figures as the most perfect and poignant example of devotion the novel possesses and, to that end, for me, provides its most haunting and enduring metaphor.